Ten sailors are missing after a U.S. guided-missile destroyer collided with a chemical tanker in the South China Sea near Singapore, a Navy official told USNI News on Sunday. USS John McCain (DDG-56) collided with the Liberian-flagged chemical tanker Alnic MC around 5:24 a.m. on Monday local time. The ship is now underway on its own power and heading into port in Singapore at the Changi Naval Base. Five sailors were injured in addition to the ten that are missing. “Four of the injured were medically evacuated by a Republic of Singapore Navy Puma helicopter to a hospital in Singapore for non-life threatening injuries,” U.S. 7th Fleet said. The crew is fighting flooding in several spaces on the ship, a Navy official told USNI News on Sunday night. The ship has limited propulsion and electrical power but good communications as it heads back into port. The big deck amphibious warship USS America (LHA-6) is steaming toward McCain to offer support to the stricken destroyer. “Initial reports indicate John S. McCain sustained damage to her port side aft,” read a statement from U.S. 7th Fleet. According to U.S. 7th fleet, Singapore Navy SS Gallant (97), RSN helicopters and Police Coast Guard vessel Basking Shark (55) are rendering assistance. MV-22s and MH-60s from the America Amphibious Ready Group are also responding to the incident. The collision of McCain follows the June 17, collision between destroyer USS Fitzgerald (DDG-62) and the merchant ship ACX Crystal. On Thursday 7th Fleet commander announced punishments for several crew members who were on duty when the early morning collision occurred. Earlier this month, the destroyer conducted a freedom of navigation operation past the Chinese artificial island on Mischief Reef. The following is the complete statement from 7th Fleet. 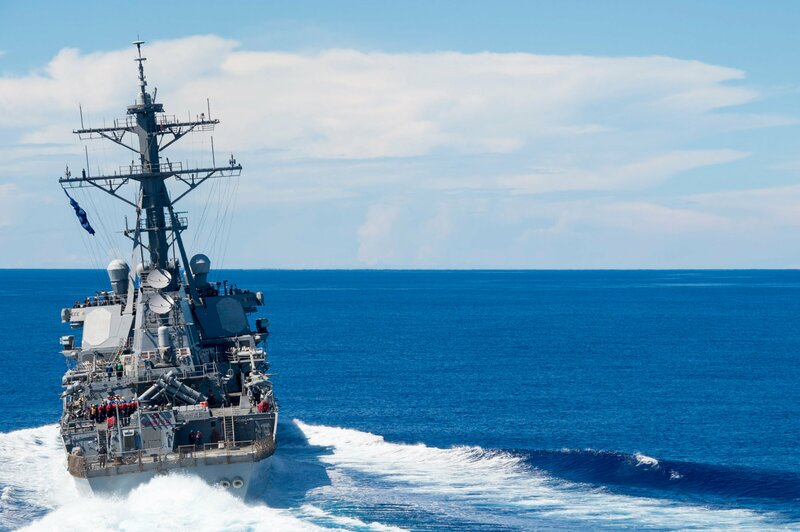 SOUTH CHINA SEA – The guided-missile destroyer USS John S. McCain (DDG 56) was involved in a collision with the merchant vessel Alnic MC while underway east of the Straits of Malacca and Singapore on Aug. 21.